The price you found is 13% lower than this hotel's average rate of $645/night. Thank you for your lovely review of your stay at Carlisle Bay. We are so pleased that you enjoyed the resort and particularly the service from the team. I have noted that the watersports team did not provide our normal levels of service and of course will address this with them, I do apologise. We do hope that we are able to welcome you back to Carlisle Bay again at some point, and will certainly ensure that we have a warm and welcoming watersports team, equipped with a working pedalo! The price you found is 34% lower than this hotel's average rate of $310/night. The price you found is 20% lower than this hotel's average rate of $499/night. Our overwhelming reflection from our holiday was just how friendly everyone was. Always time for a quick chat even when serving. Big call outs for William and Navin in the restaurants - we thought management serving was great leadership but both were just so amiable even when busy. We loved Latisha, Colleen and Denathlee - lovely ladies. Jason in the bar (we called him Jason.com as he was full of knowledge) couldn’t have been more pleasant. Always remembering our order and having it ready. Jerome always brought us a coffee on the beach and afternoon tea spot on time. Overall we felt everyone was ahead of the game. It made us feel special. The beach is beautiful as are the gardens. Well tended and pristine every day. We loved using the beach every day. I went snorkelling too which is worth it but we’re not talking Indian Ocean here - Cades reef is rather a sad place. We enjoyed our room, we took a top floor and had a beach view at the front and mountain view at the back and we loved being able to leave the curtains and shutters open. The room was clean and well fitted. We occasionally missed out on supplies but it’s easy to call housekeeping. We found the dining excellent. At the end of the day this is a hotel - albeit far from cheap. The quality of food was consistently good - we loved East- I’ve reviewed East separately. We treated ourselves to running through the wine list which is good / expensive but good! We used the Spa twice and had excellent treatments- my only comment is that the Spa is starting to look a little tired. If you’re looking for swish this isn’t. It has that (apologies to my American cousins) rather American feel - it’s about the treatments but not about The Experience. So what didn’t we like. Our first ten days were tranquil and calm but sadly we missed that it was children’s holiday in the US for our last days. In the first week we relaxed by the pool every day. In the second it was a hell hole of screaming kids. We physically noticed that service whilst still friendly slowed when the hotel was full plus we had one night where only one restaurant was open and it was crammed and noisy. So overall a wonderful stay but choose your time carefully. The whole place transformed when there were kids everywhere! Certainly I wouldn’t ever want to go back during school holidays but we’d love to return when it’s quieter. Thank you for taking the time to post a review of your time at Carlisle Bay, we are delighted that you enjoyed your stay. And a special thank you for mentioning the team members who really made a great difference to your holiday, I will be sure to thank them personally for their super service. We do appreciate your comments and understand that it can seem different during the school holidays - if you do consider coming back again one day please do let us know and we can recommend the best dates to avoid the busier school holiday weeks. We do hope we are able to welcome you back soon. The view, the beach, and the food are the strongest assets for the Carlisle. There several other things we enjoyed during our 3 night stay. The staff will go out of their way to assist you. All you have to do is stand still and look confused or uncertain and someone will not only help you but guide you to what you are looking for. Okay, then on to the a few minor problems. When receiving a tour of the facilities, our host pointed out the several places where food is served, but forgot to tell us it is best to make reservations and to point out not all food serving places were open every day. We ended up not being able to eat where we wanted to as a result. And although the food was excellent, the beef was over tenderized. The Carlisle does not offer transportation to and from the airport as do most other resorts on the island. They will provide a taxi at an additional cost of $47. We were there during Valentine’s Day and trying to make reservations was maddening as we were told conflicting information depending on who spoke to us last. After receiving a complimentary tennis lesson I was so impressed that I made arrangement for a private lesson. I had to re-schedule due to a severe case of diarrhea, but no one showed up. (The gift shop that supplied some drugs was not opened as scheduled.) I pass this off lightly though due to the excellent instruction given previously. In fact it was one of the highlights of our stay. Thank you for taking the time to post a review of your experience at Carlisle Bay. We are delighted that you enjoyed your stay. Further to your comments, we are reviewing the operating hours of the restaurants to make it easier for all guests to dine where they wish and I am sorry that this was an inconvenience for you, my apologies. I am also sorry about the tennis pro not coming as scheduled and I will certainly investigate what happened. We hope we are able to welcome you back one day soon. Carlisle bay is the perfect bay on Antigua. Sand and water there are a 10 plus. Great restaurant on the beach. The resort is right on the beach and you are steps away from the sea. The resort is first rate. Thank you very much for sharing your experience at Carlisle Bay. We are so pleased that you enjoyed the resort and the beautiful bay. We hope that you are able to come back to Carlisle Bay again soon. Relaxing time and great stay for the 2nd time around! I have to admit I find the tripadvisor reviews so helpful but contribute to so very few of them. 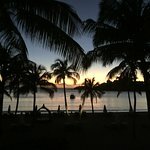 I have traveled the world and have stayed at many hotels; what makes this place unique is the beautiful beach, amazing scenery, grounds, amenities, and more importantly, the management and staff. We loved this place so much, it was our second (and likely not our last) trip there. Unfortunately, our youngest son did not feel up to par for most of our trip so we did not take advantage of the kids club. I do want to stress that having one that starts at the age of 2 years old was one of the major selling points for us as parents of 2 young boys...I think it could provide a nice reprieve for parents out there who may feel like they need a little adult time during a family vacation. I don't want to scare off the adult vacationers out there, although the resort is very family friendly, there's an adults only section with an adults only restaurant to boot. We almost did not make this vacation. We had missed our flight to Antigua in early December. Frantically, at the airport on the day of our reserved car and stay, I called the hotel to let them know we were not able to make it and to see if they had availability the next week (the earliest flight possible) to determine whether it was worthwhile to rebook our flights at a substantial last minute premium. Management at Carlisle Bay became our white knight. 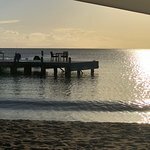 In comparison to our two-hour logistical nightmare at the airport with two little ones in tow, the management and staff at Carlisle Bay made it so effortless for us. To our relief, they were able to offer us the same accommodations we booked without any cancellation fees or change in room rates. I fully recognize that the hotel did not have to do this, as cancellation fees are expressly stated when one makes a reservation (for that reason, there’s a booming travel insurance industry). Yet, I am eternally grateful as we were able to experience our vacation “as planned” without having to disappoint our sons. This and the level of service I received while on our vacation, were above and beyond expectations. A true hallmark of a quality resort. The only areas for improvement would be the lack of variety of food choices and availability of towels at the pool. There are only three restaurants available to families, other than room service. One restaurant, East, is not opened on a daily basis and is only offered in the evening. The other restaurant, Indigo, is opened daily, but its menu does not seem to change. I can see this being problematic for people staying longer than we did, as we were a little bored with our food our final meals there. One suggestion is to have rotating menus. I would also love to see more access to local cuisine. Other than that, we had a VERY FINE stay. We will be back! Thank you very much for posting a review of your stay at Carlisle Bay. We are delighted that you had such a nice stay with us (and that we were able to make it happen in the first place!). It is always a pleasure to hear back that the service was beyond expectations and the team will be thrilled to read your comments. We do appreciate your feedback regarding the restaurants and the pool towels - we will certainly review how we are doing things so that we can improve in these areas. Thanks again for letting us know about your experience, we hope to be able to welcome you back to Carlisle Bay again one day soon. Stunningly beautiful setting, with the best bay frontage in Antigua. I don’t know of a more idyllic beach offering this level of privacy, yet on an island with full facilities and lots to do. The only competition in The Caribbean tends to be on smaller islands and then you miss out on either the quality of hotel or they just dont have enough to do. Lovely big rooms tastefully furnished and ever so comfortable. What is impressive is just how positive and charming the staff are. Carlisle Bay seems determined to get better still, with a fresh air of enthusiasm to ensure Carlisle Bay’s success as Antigua’s very best hotel from the friendliest of staff. They are not resting in their laurels, far from it, from my experience of a short visit this January. We look forward to a future visit. Thank you very much for your review of Carlisle Bay. We are so pleased that you had a wonderful stay, and really appreciate your kind words regarding the team. I will be sure to share your review so that the whole team can see what a difference they do make to the overall experience. We look forward to welcoming you back to Carlisle Bay again soon.